Activity of PJSC RusHydro is connected with a number of risks which in certain conditions may adversely affect its production and financial performance, social and natural environment. To reduce the negative impact of potential hazards and optimize favourable opportunities, a risk management system has been created to ensure the implementation of the Company's strategy. To organize risk management processes, the Company established and operates the Risk Management and Control Department as part of the internal control and risk management unit. Quality of the Company's risk management system is regularly confirmed by an independent jury of international competitions. In particular, PJSC RusHydro was earlier recognized the winner of the competition in such nominations as the Best Comprehensive Risk Management Program, the Best Risk Manager of Russia, conducted by Russian Risk Management Society RusRisk – Russian national association of risk managers, being a member of the Federation of European Risk Management Association (FERMA). The competition has been held annually since 2006. In June 2015, as part of of the 13th International professional forum Risk Management in Russia and CIS, the risk management program of RusHydro has become a winner of the annual competition Best Risk Management 2015 in the category Production Organizations. The Resolution of the Company's Management Board of November 2014 approved the Development Program for Corporate Internal Control and the Risk Management System of RusHydro Group until 2019. Competitive environment in procurement, works, and services. The Company's risk management policy implies timely identification and prevention of possible risks in order to minimize losses. In October 2015, the Audit Committee of PJSC RusHydro approved the POLICY on Internal Control and Risk Management of PJSC RusHydro as amended. In November 2015, the Board of Directors of PJSC RusHydro approved the POLICY on Internal Control and Risk Management of PJSC RusHydro as amended. The new version of the Policy takes into account the new requirements of the regulatory and methodological materials in the field of internal control and risk management for public-owned companies, the best world practices and the main provisions of ISO 31000 Risk Management - Principles and Guidelines. 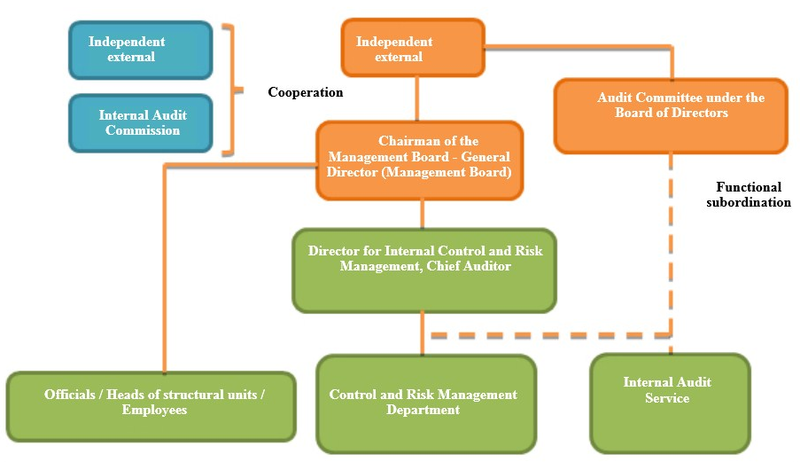 The document reflects changes in the organizational structure of PJSC RusHydro and accumulated experience in developing corporate systems of internal control and risk management.